The title of the song (and this post) refers to when Australia was selecting a location for its federal capital city – somewhere between Sydney and Melbourne. One hundred years on, the city is still growing and evolving. Whether Canberra can claim to be a city of national significance or is really just a collection of suburbs joined by roads and green spaces and interspersed with a few national monuments and institutions is a matter for debate. When I moved to Canberra over 20 years ago, one of my friends used to joke that the three best things about Canberra were its proximity to Sydney, the coast and the snow. She was obviously not alone as this sentiment is reflected in the song with its references to Bateman’s Bay and Thredbo. The lyrics also make fun of Canberra’s cool climate (being sub-alpine) and how easy it is to get lost on the circular streets, parkways and roundabouts (but delight in the fact that we don’t have any toll roads). This is a city that people – including Canberrans – love to knock. However, it’s an easy place to live and offers many of the benefits of a much larger city in terms of the arts, recreation, universities and employment without the disbenefits such as peak hour traffic and pollution (especially given its modest population of around 380,000). 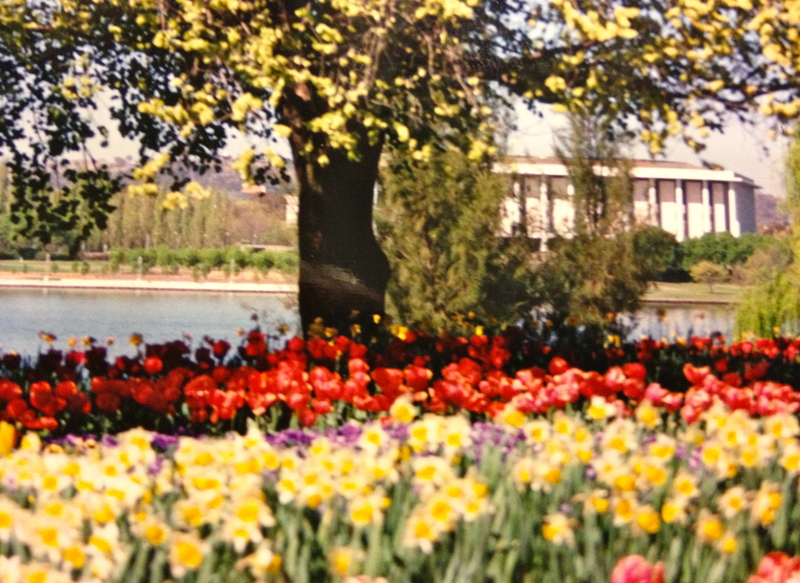 There are also lots of special and unique features to love about Canberra, such as hot air balloons over Lake Burley Griffin on a frosty morning, the snow capped peaks of the Brindabella Ranges, picnics on shady banks of the Murrumbidgee River, long walks in nature reserves just minutes from home, jazz concerts on the Eucalypt Lawn at the Botanic Gardens, twilight drinks in the Sculpture Garden at the National Gallery, autumn colours viewed from the top of Red Hill, the Folk Festival at Easter, the masses of spring bulbs at Floriade, and dodging kangaroos on the drive home late at night. So maybe there are now four good things about Canberra – that it’s close to Sydney, the coast, the snow and the hearts of the Canberrans who have made it their home (even if they hate to admit it). * ‘Smack Bang in the Middle’ was written by Karen Strahan and Jill Walsh and recorded at the ArtSound studio in Manuka in collaboration with many local singers and musicians. ‹ If you can believe in bigfoot, then why not drop bears? I think there is a bit more to the location of Canberra that has ever been publicly justified. Not only is it not located geographically between Melbourne and Sydney, it is disconnected from the main transportation routes between Melbourne and Sydney. As for Albury being too close to Melbourne, it is still a good 4 hours away by car today and 100 years ago, it was basically a journey too far for 95% of the population to make. I would suspect that the greater concern was that regional Victoria was Kelly Country and Eureka Stockade country. At the time, threat of revolution loomed large so politicians wanted an isolated capital, and just as Brasilia was located in the middle of the jungle to isolate, Canberra was isolated. For many decades, it only had 4 tarred roads entering and leaving it. I even suspect the urban design of Canberra took into consideration public revolt. In France, designers planned for revolt with wide boulevards that allowed the government to quickly get soldiers into the city. In Canberra, perhaps the idea was to separate everything with sheep farms in the knowledge that an angry mob storming across a sheep paddock would run out of emotive steam much quicker than an angry mob storming through streets where they could deface public monuments and smash windows. Understandably, politicians aren’t going to say we isolated our capital because we were scarred of public revolt but I looking at a whole range of factors I think that is the logical conclusion. I decided to focus only on the issue of distance from Melbourne and Sydney in my post but clearly there would have been lots of other issues taken into account in agreeing on the final location. I always thought an inland location (with a seaport at Jervis Bay) was preferred to avoid the risk of naval attack (i.e. external rather than internal conflict) but I couldn’t find anything about this on any sites that I was willing to reference – except maybe in relation to the decision to locate HMAS Harman here years later. I had visited before but only moved here in ’93. It’s changed a lot since – mostly for the better – and is still beautiful as far as I am concerned. Unfortunately, some people equate clean and lack of clutter with boring.